Mitsubishi Rayon, an affiliate of the Japanese OEM, and Continental Structural Plastics announced Tuesday they’re planning a joint venture to develop carbon-fiber pillars and panels for North American vehicles. The news release seemed to indicate the two companies have for now partnered to study the idea of partnering, but both businesses also seemed confident they’ll ultimately produce the joint venture. Nikkei Asian Review on Tuesday reported that details of each side’s investment would be revealed later and the formal partnership would come within the year. 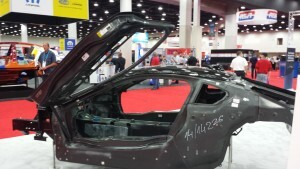 So basically, everything body shops handle — and CSP hopes the partnership will help yield cheap enough carbon fiber that more collision repairers could actually encounter such cars. Interestingly, Macher just last year had questioned whether carbon fiber could truly be cost-effective enough to compete with other lightweighting. Nevertheless, carbon fiber use in vehicles in general would grow from 3,700 tons industrywide to 10,800 tons by 2030, he projected. But these kinds of partnerships and OEM interest could yield the kind of advances and scale needed to cut these costs. Ford announced in April 2015 it would work with DowAksa to advance automotive cost-effective carbon fiber with the goal of mass production for vehicles. BMW last year expanded its carbon fiber to the mass-market (well, the rich masses) with the 7 Series. Nikkei Asian Review reported Mitsubishi Rayon wanted to grow its overall carbon-fiber business nearly 70 percent by the 2030 fiscal year to $882 million. In November 2015, it reported Mitsubishi Rayon planned to its double carbon-fiber production capability in three years and would probably grow from No. 3 to become the third-largest Japanese composite manufacturer.